← In impoverished Bolivia, evo’s new palace is an insult to our people! Mr. Shimose also writes profoundly on some current sociopolitical issues, I admire his work and talent! To be Latino is to belong to a unique community that’s far more diverse than most people realize. Some speak Spanish; some do not. Some are Black; some are white; some fall somewhere in between. Some are immigrants; some are American-born. And many, like myself, are multicultural. Growing up Filipina and Mexican meant that I didn’t have many role models who looked like me. I wasn’t sure that other Mexipinas even existed. Further complicating my identity issues is the fact that I don’t speak Spanish well, and I don’t speak Tagalog at all. Not seeing examples of other Asian Latinos in books or on TV only exacerbated these isolating feelings. Fortunately, when it comes to cultural representation in entertainment, politics, and beyond, we’ve made some noteworthy progress in recent years. We’re seeing more TV shows like Jane the Virgin and Vida that tell the stories of traditionally marginalized communities. And people of color – specifically women of color – are running for office in record numbers to help create change at all levels of government. Yet as it turns out, Asian Latinos, specifically, have been making their mark across a range of disciplines and industries – they’ve just been overlooked and underappreciated for their contributions throughout history. Here, we honor a few of those individuals whose lives and legacies should be celebrated for years to come. 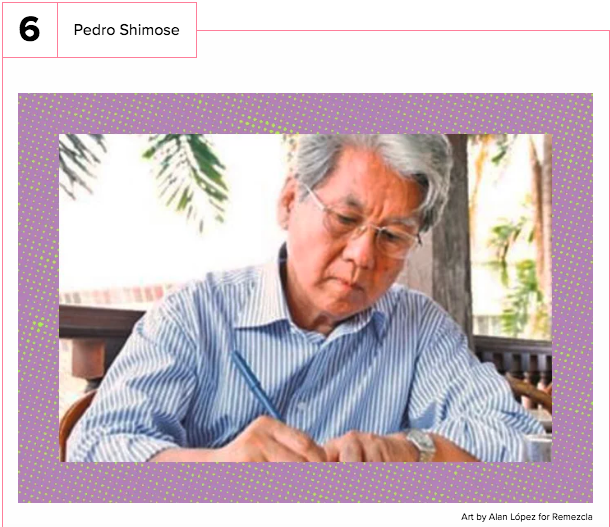 Born to Japanese parents in Bolivia, Pedro Shimose began his writing career as a journalist for the newspaper Presencia. He then moved into the world of poetry, crafting poems that were often politically inspired and that touched on issues like national identity. In 1972, Shimose was awarded the Casa de las Américas Prize for the book Quiero escribir, pero me sale espuma. In total, he’s published seven poetry books, in addition to El Coco se llama Drilo, a collection of short stories. Shimose currently lives in Spain, and is a member of the Bolivian Academy of Language and the Spanish Association of Art Critics. This entry was posted in Bolivia and tagged Bolivians abroad, poetry. Bookmark the permalink.